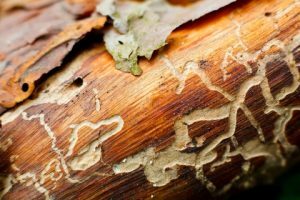 The powderpost termite, or Cryptotermes species of termite, is a unique termite that thrives here in California. Due to the powderpost termite’s unique ability to thrive on very few resources, they can easily survive in an entirely wooden habitat. Let’s take a look at the ideal powderpost termite habitat, so we can better understand how to avoid their infestation, and how to control these termites once they’ve entered a home. The powderpost termite favors rather dry wood, and it does not require access to mud or water. Let’s identify the type of wood that powderpost termites seek out, and let’s note the powderpost termite’s unique independence from water and mud. dry wood structures throughout your home – or even in your furniture – you could be providing the ideal home for powderpost termites. Powderpost termites, unlike several other termite species, don’t rely on other sources of water or mud. They can subsist solely on dry wood material, and they consume sufficient amounts of water from the wood itself. In addition, they do not rely on mud tunnels to provide a route to food or water. Again, they can thrive solely off of dry wood. Powderpost termites gain their infamous name due to the powder-like substance they leave behind. Up close, powderpost termite droppings are actually small hard pellets. Powderpost termites don’t leave many holes to the exterior world within their structure (in fact, they can seal holes that they create), so it may be difficult to identify a powderpost termite infestation until the colony has become quite large. If you note a powderpost termite infestation, it’s time to act; powderpost termites can weaken your home’s structure, and they can destroy furniture and property. Give us a call here at Hi-Tech Termite Control. We provide termite inspections, exterminations, and protection services. 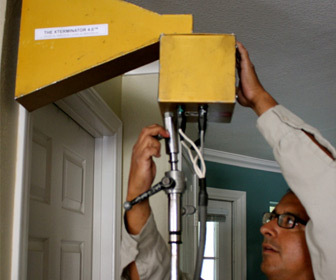 You can learn more about our microwave treatments here (a unique alternative to tenting and fumigation), or get started by getting in touch with a Hi-Tech Termite Control representative. We provide termite control solutions for folks throughout Los Angeles, San Diego, and Orange County.